Scientists continue to be caught off guard on incoming dangerous Asteroids and/or fragments. Today, Nov 2, 2016 an Asteroid passed very very close to Earth. It was discovered close to within 24 hours before its flyby. The danger is increasing. The Near-Earth Asteroid 2016 VA, traveling at 47,810 mph, was discovered by the Mt. Lemmon Sky Survey, Arizona, USA on 01 NOV 2016, All Saints Day. The Minor Planet Center alerted astronomers of the sudden finding the same day. The “condition code” or uncertainty on this asteroid was high, rated at 7 – where 0 is being good and 9 being highly uncertain. This dangerous Fragment/Asteroid has matching origins to the Large Asteroid that was hit with numerous detonations. it is from behind Earth (relative to Earth’s orbit). it matches an Earth Gravity Well curvature from origins of the Large Asteroid detonation(s). The danger of a 24 meter asteroid striking the Earth has an explosive energy equivalent of over 30-40 Hiroshima Nuclear bombs. (See below). NASA, the European Space Agency (ESA), and scientists in the know must inform the public of the recent events on the nuclear deflection detonations on the Very Large Asteroid (still in space following the Earth, but moving slowly away). A very close flyby of a dangerous sized asteroid surprised astronomers as it was discovered just before it passed Earth. The estimated size of the Asteroid is from 11 meters to 24 meters. The Chelyabinsk Russia meteor was noted as 17 meters. Witnesses reported that it was as bright as the Sun or Moon. 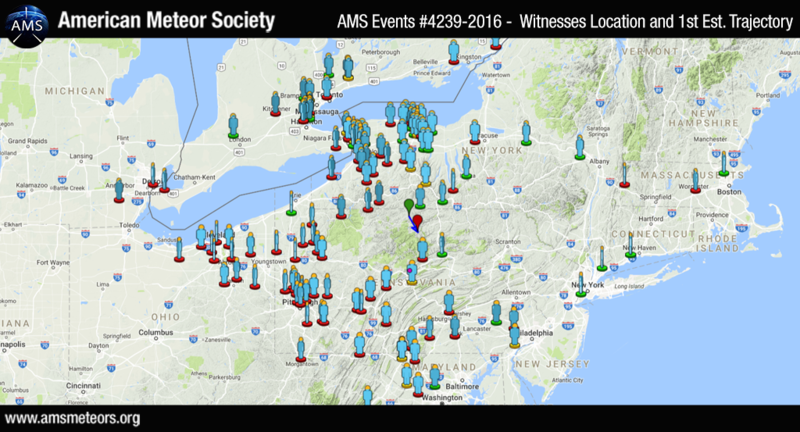 Nov 1 Fireball – Over 130 reports about a fireball observed on All Saints Day Nov 1, 2016 over Pennsylvania USA (8:15pm EDT). Witnesses reported this sighting from Maryland, New York, Connecticut, Ohio, Virginia, West Virginia, Michigan, Massachusetts, Delaware, and Ontario (Canada). NASA and the European Space Agency (ESA) are preparing the public in awareness of potential destructive Earth collision course asteroids. Yet government agencies are still quiet regarding the incoming Earth fragment threats from NASA & ESA knowledge of the recent Large Asteroid mitigation detonations. Recent information, revealed in these news articles, have quotes from NASA and ESA on the existence of the reality of potential catastrophic Near Earth Orbit asteroid impacts. The timing of these articles coincide with a close flyby to Earth of Asteroid 2016 UR36 on October 31, 2016 where 2016 UR36 is estimated to be 13 meters in size. A common quote from NASA and ESA scientists: “we may miss one”. But what if they already knew where to look and what is coming? This is a method of establishing “plausible deniability” if a catastrophic meteor strikes. The Hiroshima nuclear bomb’s explosive yield was near 13 to 15 kilotons of TNT in equivalent detonation energy released. The detonation was maximized for destruction as it was designed/occurred near 1,960 feet above the ground. In comparison, the Chelyabinsk Russia, meteor that exploded on Feb 15, 2013, is estimated to yield a detonation energy of near 470 kilotons, nearly 31 times greater explosive energy than the Hiroshima nuclear bomb. Still, near 7,200 buildings in six cities in the region were damaged by the explosion’s shock wave and over 1,500 people were injured seriously enough to seek medical treatment. NASA, ESA, and a consortium of participating scientific agencies have been tracking this Very Large Asteroid for most of this year. The higher resolution near-infrared images from NASA telescope data clearly reveal this object, its flight path, and the subsequent detonations to deflect and slow it. There is even a marked up image to the exact X,Y location of the Asteroid (Sept 2, 2016, 22:09:21 s4h2A image) by NASA. Yet, from Aug 25 2016 to Oct 30 2016, NASA, ESA and all of the other scientific agencies have not revealed this information to the public. The largest Nuclear detonations have left unmistakable evidence in other telescope imagery – to those that know what to look for. In the end, NASA and ESA will lose the trust of the public. By choosing to be silent, with such great evidence already observed and documented, there is no avenue to take “after the fact” for these scientific agencies to explain their withholding of information. The public will forever lose their trust. This loss of trust will also fall on many other scientists who the public would see as “not speaking up”. As the Nuclear detonations on the Asteroid occurred inside and outside of the L1 gravitational balance distance between the Sun and the Earth, many Chelyabinsk or larger sized Asteroid fragments will enter a complex gravitational spiral path with a great risk of fragments falling to Earth. Before a catastrophic fragment strikes, it is now time for NASA and ESA to go public. Complete honesty is the only acceptable path. These news stories include disclaimers from NASA and ESA scientists that “we may miss one”. This is not being honest to the public. The unmistakable evidence of the Very Large Asteroid, successfully deflected, remains in plain sight. The massive effort to launch rockets, coordinate the detonations, and thus creating the complex spiraling orbits of very dangerous fragments has left unmistakable evidence (will be revealed) to the public of these actions. Their own telescope data, flight path deflections, slowing, and new orbit proves their foreknowledge of this Large Asteroid and the actions taken. The public will not forget.